Well, this was really fun and I didn't want Mom to miss it. 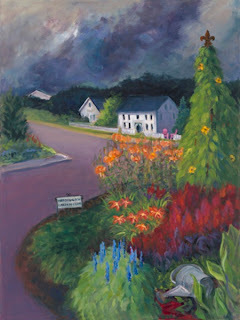 If you look closely, there are two pink chairs above the lilies and to the right of the brightest house. You can see them through the opening in the fence. I was asked to do the cover for a new murder mystery for author Neal Sanders. I read the manuscript, and then Neal and I were back and forth with ideas and designs. My goal was to make it both compelling, and at the same time threatning, with a big dose of a hint of how garden clubs help to beautify our towns. In the end, we both loved it and it was used on the cover of his book! It is a great read and it is now available on Amazon or directly from the author! A Murder in the Garden Club - the book!